What a wonderful facility for this growing coastal community! 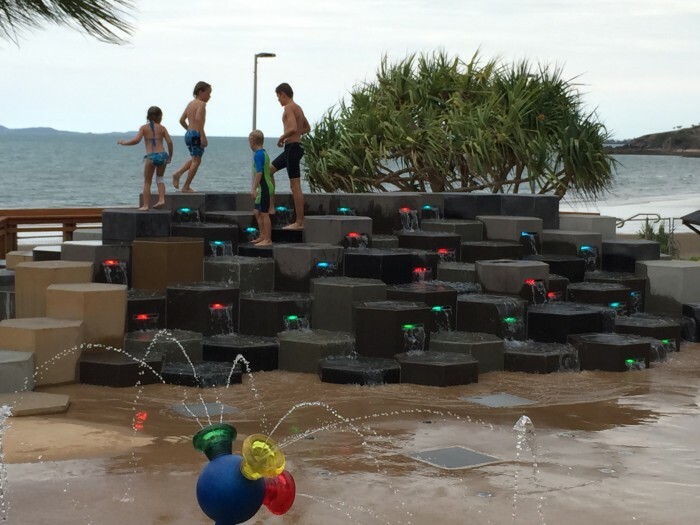 Thousands of people turned up for the opening of this zero depth aquatic playspace – part of Livingstone Shire Council’s overall foreshore redevelopment. 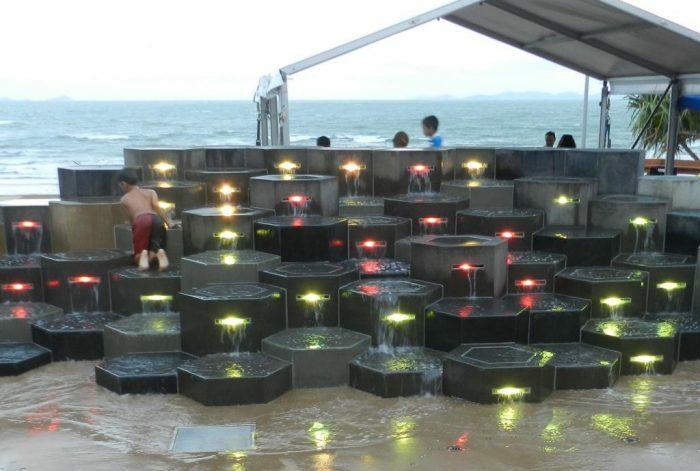 Themed around the mythical ‘Kraken’ – a giant sea creature that attacks ships along the Keppel Coast! Playscape Creations was asked for input late in 2014 by Vee Design, for a project that (at that time) was a likely possibility to go ahead during the next year. 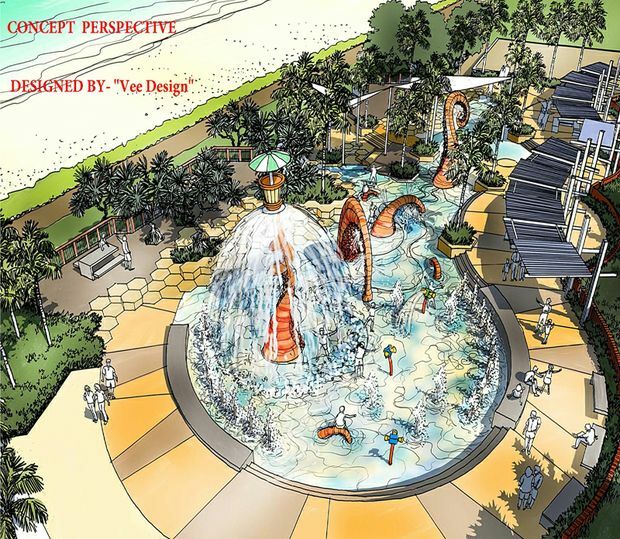 Vee Design’s brief was pretty clear – they wanted a high impact waterpark that was aesthetically appealing day and night, 365 days a year. Unlike regular waterparks or splash parks, Vee wanted a real point of difference – not just “bent bits of pipe”. They also wanted a light spectacular and really like the idea of water and light combining to create a moving, almost living, luminary experience. Playscape Creations immediately went about producing prototype options and after consultation with the designers, came forward with a workable module that included LED lighting and fitted neatly within custom hexagonal precast concrete blocks to be used extensively throughout the site. We then added many features from the vast array of spray features provided by our US based manufacturing partner, Fountain People Inc. with their proprietary ‘Aqua Armour’ coating on all ground sprays and including a number of rotating sprayers with the unique ‘Colourcast’ nozzle spouts – all creating a rich and colourful dynamic in the park. Partnering with the design team also included working with renowned artist David Joffe and his company Natureworks, integrating water features into his bespoke feature artwork – which became the tentacles of the ‘Kraken’. 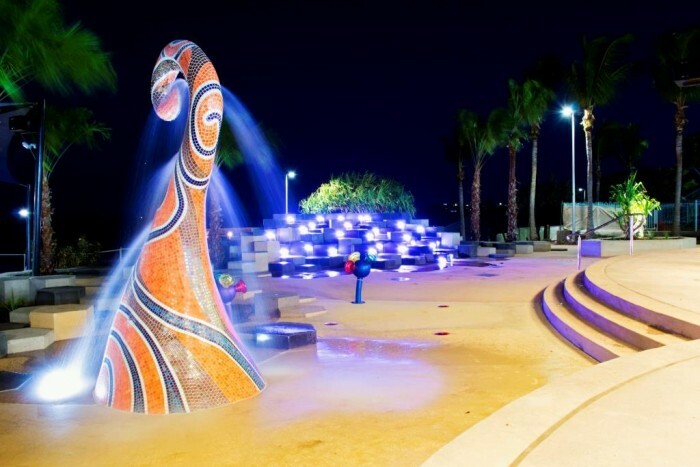 When it came to construction, Playscape Creations worked closely with Principal Contractors, JM Kelly Builders, to install over 120 water delivery outlets and feature lights throughout the site. Playscape Creations worked on site for almost the entire construction phase of the project under the supervision of Project Engineer, Nicholas Veraart. The scope included construction of all drains and return lines to the plant room, water delivery lines to manage the 6000l/minute water delivery to the pad, and full set out and installation of the plant room with integration to the 40,000l balance tank built within the structure. 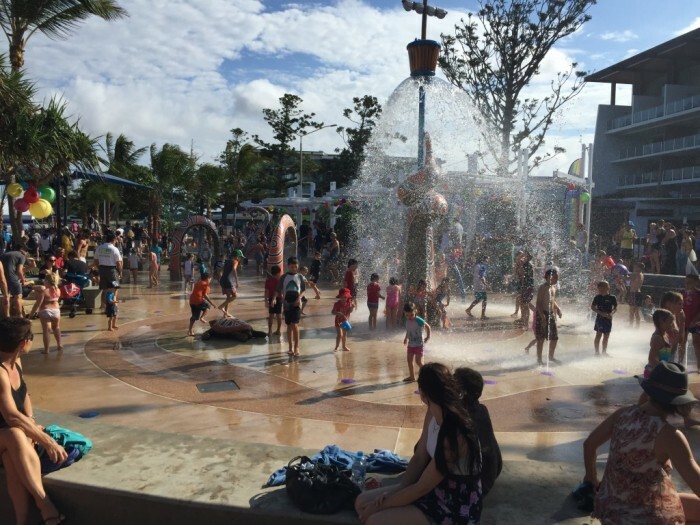 While park users are attracted by the interactive water sprays and visual features, the most important aspect of any water park is the quality of the water, and ensuring all health and building codes are met, or exceeded. To ensure the highest quality and best outcomes we engaged Electrical, Hydraulic and Structural engineers, as well as specialist industrial hydraulic technicians and electrical contracts to perform the technical plant room fitout. The water management includes to PLC controlled programmes for pump control and water outlet valve management. 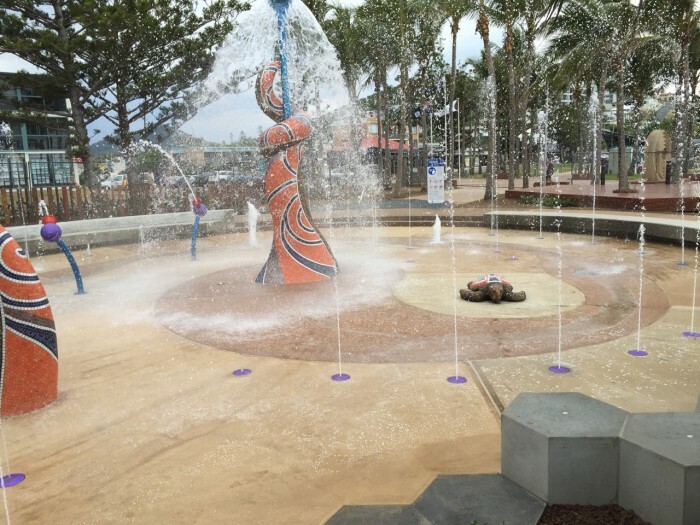 Two 3 phase pumps deliver water via 2 x 16 valve manifolds managed by the Water Odyssey Controller, allowing the park to run as a fully automated system. Meeting the health codes is the highest priority hence our installation included a Neptune Benson ultra-fine filtration plant, automated chlorine and acid dosing with remote communication back to Council offices. 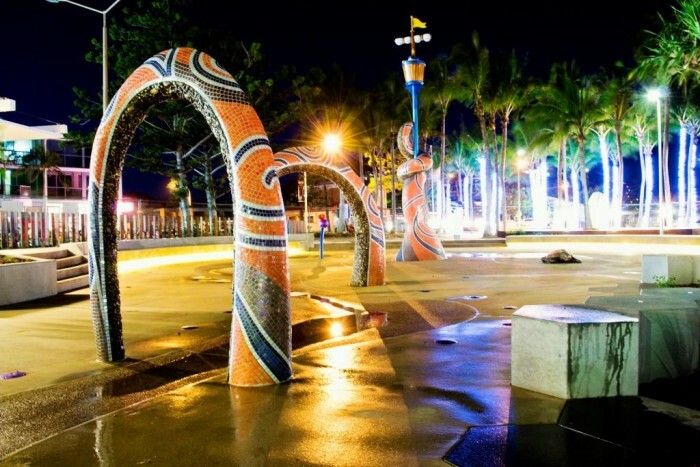 When works were completed, Playscape Creations was also on site to operate the entire park through its opening stages and worked with Council to train staff in the operation of the plan, ensuring efficient maintenance of this vast investment. 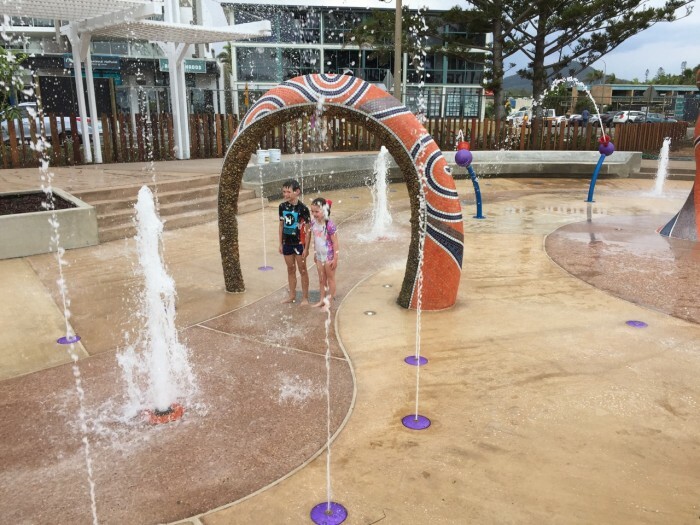 Read more on our Point of Difference here – why you need to choose Playscape Creations to deliver your Aquatic Sprayground!